The 2019 season opener started on a beautiful autumn day at Keysborough. Many familiar faces and a few new ones in a strong lineup for the Rovers. Old face Tate opened up the first goal courtesy of a free kick turnover from a new face Garrow who laid a very strong tackle. The new face (Garrow) then followed up with his first goal in senior footy, up from last year’s U19 side. 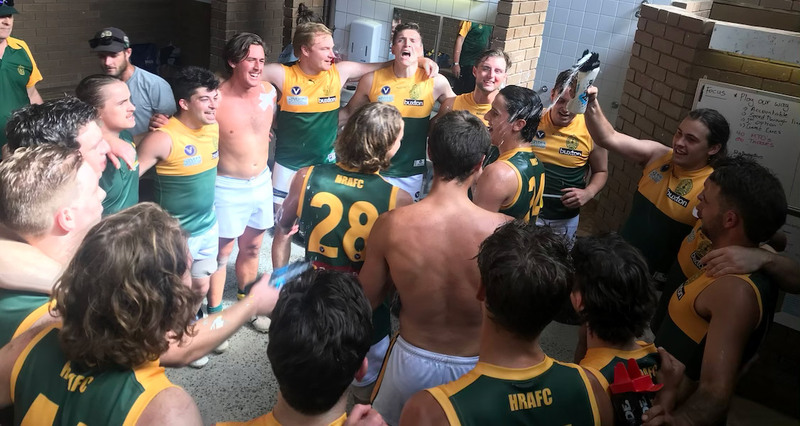 Mentone replied with a goal kicking with the aid of a breeze over their shoulders. A short time however later a left foot snap goal by Corey Jones was soon followed by a strong mark and goal by Nick Jackson and the Rovers were flying! Mentone then snapped into gear with 2 late goals before the siren sounded. Pretty much totally against the play and suddenly the lead was back to just 7 points. Playing on the smaller ground at the Mentone Grammar Playing Fields, the pressure was intense from the start through to the end. Tackling was the order of the day with the Umps not really protecting the ball gatherer I thought, with most frees going to the tackler rather than the player winning the contested ball, although this was consistent throughout the match. The second quarter started well again for the Rovers. A string of play along from the wing ended with Naha’s unselfishly dishing it over to TJ who kicked his first goal for the day. Mentone responded with a goal and it was game on. Merlo was showing plenty of dash and taking some good marks, while Lovig was increasingly imposing himself on the game and the rust scales were starting to be shaken off as he improved his ball handling each quarter. Daley, Huggy and Stewart showing plenty of dash around the ground. The 2nd Rovers goal was by Terjung who was well set up by Naha’s again. Mentone however again finished strongly with 2 more goals and the lead was cut to 3 points at half time and the game was clearly in the balance. The 3rd quarter started well for the Rovers with CJ kicking 2 early goals – the second after being on the receiving end of a great pass from Huggy. But to the credit of Mentone they kept going hard. They replied with a couple then the Rovers responded again with goals to Merlo and Jacko and finally TJ after a late tackle gave him a shot at goal. The game had actually opened up a bit in this quarter and Mentone had 9 shots at goal for a total of 3 goals 4 behinds while the Rovers were more accurate with 5 straight goals, to have a handy 11 point lead at the last break. Ebbott was busy as you come to expect, burrowing in relentlessly at contested ball. The rucks had their hands full against the bigger Mentone followers but crucially provided plenty of contest. While the backs led by skipper Jewell were relentless at applying plenty of pressure at every entry. A couple of rather silly frees resulting in Mentone goals tarnished an otherwise good quarter. So we came to the last quarter and the question was to be asked – who wanted it more and could deliver? Well the Rovers answered it emphatically with 3 goal 3 behinds to a single point by Mentone. Not that Mentone were off. They were dominating the air with several big strong marks and often looked threatening but the pressure by the Rovers led to turnovers across the midfield and CHB, which led to forward entries, which resulted in 2 more goals to Jacko and a second for the day to Tait. The Duck was really on fire and using his strength and “get out of my way” attitude helped the Rovers dominate the contested ball. Cougs was providing good linkage and plenty of dash out of the backline, while Innes was also in fine form and J-Love was nearly back to his best touch. Credit to the mids and backs keeping Mentone to a goalless quarter. The Rovers running out comfortable winners by 31 points. A good start to the season. The standard was actually pretty good for a season opener and there was some very encouraging teamwork to move the ball quickly and to others in a better position. Well done!